The Romans Empire was one of the biggest and best-organised in history. It began more than two thousand years ago, with the founding of the city of Rome. In the early days the Romand were ruled by Kings. Rome then became a repulic with the Romans voting for governors. Finally in 27 BC Augustus siezed power and became the forst of Roman's Emperors. 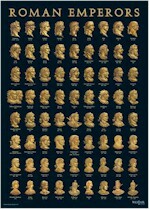 This A3 size poster shows all the Roman Emperors from Augustus in 27 BC through to Romulus Augustus in AD 475. The poster includes the famous emperors Claudius, Nero, Vespasian, Titus. The bust images, in gold, are taken from coins that were minted during each emperor's reign. A mouse mat showing the Magna Carta with colourful shields around the text and the seal of King John. A 2.5" resin model of the bust of Caesar. The model is supplied in a white box with a label on the front. A pewter corinthian column supplied on a pin with clasp. The information on the reverse of the card explains how Rome grew from a small town into a powerful city and empire. A bronze plated pewter sestertius coin supplied on a magnet. The information on the reverse of the card explains how Rome grew from a small town into a powerful city and empire.